Azmodan is a ranged Specialist who excels in pushing lanes and destroying structures. What he lacks in team utility he makes up for in sheer pushing power on any specific lane. 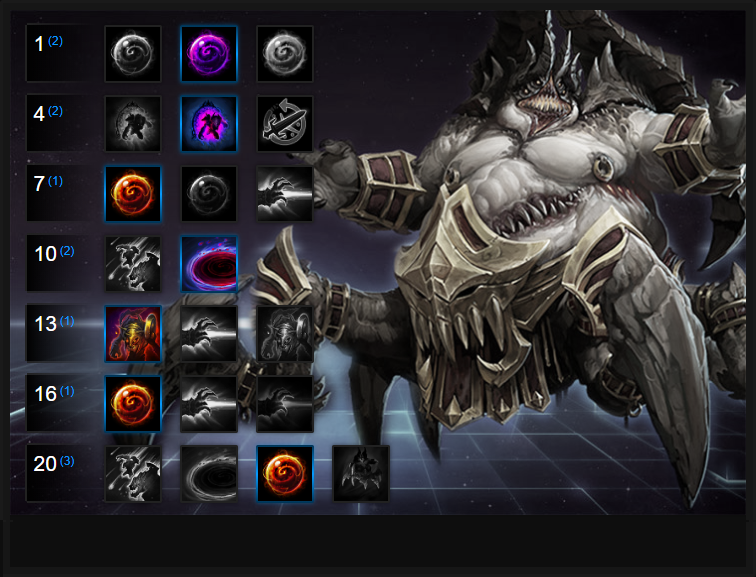 Unlike other Specialists, Azmodan isn't just good at pushing lanes, he's the king at it. With the ability to summon demons to his aid, as well as poke from afar with his Globe of Annihilation, it's relatively easy to pressure any opposition. Considering the fact he also has an enormous health pool, he can soak up a lot of damage before he needs to retreat. As noted, he really does lack mobility until late game and as a result, requires exceptional positioning to be truly effective. Demon Lieutenant (Trait) – Make sure that Demon Lieutenant is never off of cooldown. You can use it to either help push the lane you’re in, or get another lane pushing (particularly if there is a lane that does not currently have any of your teammates in it.) Keep in mind that the range on this is global and requires you to target a minion, so be aware of the best place to summon a new Demon Lieutenant. If a lane is left undefended and your minion is in it, you can gaurentee your wave will reach the enemy fort. Globe of Annihilation (Q) – This is Azmodan’s signature ability, and it can provide significant lane pressure. With its long range, enemies will need to respect it, while your team can play around its ability to scout and deal large area damage. It has a very long range and on small maps, allows Azmodan to dunk against all lanes one at a time to pressure them without having to be there. If it hits a group of enemy Heroes, its damage is significant. Ideally, try to stack its damage as quickly as possible to ensure it packs a punch when it lands. Summon Demon Warrior (W) – The most common use of this ability will be to help siege, though the warriors may sometimes simply be there to soak up tower ammo due to their low damage output. However, due to the fact that they will travel a short distance in a straight line before going to the nearest lane, they can be used for scouting, as well as blocking skill-shots. Of course, they can also aid in taking merc camps or bosses, as well. All Shall Burn (E) – It’s quite important to choose your target wisely with this ability. The damage can really add up, but only becomes truly scary after a couple seconds of channeling. If your target moves out of range, All Shall Burn will immediately be cancelled, placing it on cooldown. Be aware of your enemies’ crowd control, as being interrupted by it will take away a large portion of your potential damage output. All Shall Burn is particularly effective against Structures due to the bonus damage you receive though it's base range is relatively short. Demonic Invasion (Heroic) – If you’re looking for a pure siege build, this will likely be your Heroic of choice. The damage to Heroes isn’t particularly high, but will take down enemy structures relatively quickly. This does mean you’ll often simply be split-pushing, so make sure to communicate with your team so they can play around this. Tide of Sin (Heroic) – When used correctly, this can be a good boost to Azmodan’s damage output. Firing a Globe of Annihilation while on top of a pool can deal a huge chunk of an enemy Hero’s life. The downside is that it costs 100 mana, and a Globe of Annihilation 60, saving you 40 mana in total. That said, the cooldown isn't long and it can often be used twice within in a team fight for massive late game burst. Gluttony allows Azmodan to gain increased Annihilation stacks (from 2 to 3) when hitting Heroes with Globe of Annihilation. In addition, when you're at 200 Annihilation, you'll gain 0.5 seconds cooldown reduction per Hero you hit. In a team fight, and especially late game, this allows you to use the ability much more often. Hellforged Armor provides Demon Lieutenants and Warriors with 25 armor, allowing them to out-sustain any opposing minions, while always acting as a brilliant body-block against enemy Heroes. Art of Chaos provides Azmodan with some much needed sustain if he hits 2 or more Heroes with Globe of Annihilation. The mana restored is 30 (effectively halving its cost), while it also provides 4 bonus Annihilation stacks, allowing you to reach your 200 goal much quicker. Variable: If you want to go full basic attack, take Bombardment. This allows Azmodan to gain increased range, and a ricochet effect on his basics, after using Globe of Annihilation. For poking, without relying on the channel from All Shall Burn, it can be very strong as each hit also provides 1 stack of Annihilation. Bolstering Azmodan's Globe of Annihilation by 50%, Tide of Sin at end-game ensures Azmodan deals massive AOE burst damage if he lands his Globe. The original mana cost might be high, but the damage boost is absolutely worth it. Bolstering your Demon Warriors and Lieutenants further, Brutish Vanguard increases their health by 25%, and also allows them to slow enemies by 20%. Combined with Hellforged Armor, it allows Azmodan to bully lanes even better, while also having some light CC against Heroes. Total Annihilation further increases the potency of your Globe, allowing you to deal additional damage based on 4% of your opponents' maximum health. Combined with Tide of Sin, it boosts your output enormously. A very late game Talent, but one that's very strong. Pride, at 400 stacks of Annihilation, causes your globe to have a 15% wider area, while also dealing a flat 125 additional damage. Combined with all the above Talents, and your Heroic, it can lop off entire health pools. Variable: Azmodan's lack of mobility is his weakest aspect so gaining Trample at level 20 as an alternative will save your life, multiple times. Use it to get out of particularly dangerous situations, as the charge deals good damage and the slow is invaluable. This list of tips and tricks are just a handful of things we think will help your Azmodan play. We'll continue to add to the list as required and if you have any tips you'd like to share, let us know in the comments below and we'll place them here. 1. Ensure that when casting Globe of Annihilation you use it from maximum range for maximum damage. 2. Use "All Shall Burn" on structures and to chase / finish enemy Heroes - it's a long channel that deals a prolonged amount of damage. 3. Azmodan is strongest during team fights if he can cast All Shall Burn without being interrupted. 4. Do what you do best: push lanes and kill structures. Join team fights a little late so that you can pressure or clean up with Globe of Annihilation. 5. Never forget to use General of Hell. It's an amazing Trait that allows you to really push lanes - it's also global! 6. During team fights, try to stay at the back. You're a great body block if neccesary but also useful at dunking from afar for maximum damage. 7. You've a high healthpool but that doesn't mean you should meat-shield constantly. Remember your positioning by trying to stay on the edges of fights ready to run away. 8. Don't be afraid to use Demonic Invasion on enemy structures - your grunts deal double damage to them. 9. Early game priority, besides laning, is to get your Globe of Annihilation up to maximum damage. Kill as many minions as possible! 10. Remember to cast Sin's Grasp on weak targets as it'll add lots of pressure to them, especially if you're using All Shall Burn. 11. Always stack your Globe of Annihilation. You need to cap it for maximum damage as quickly as possible so fire it at all minion waves across lanes. 12. Try to pressure all lanes with your Globe of Annihilation. If you can, sit in mid lane (especially on smaller maps) and rotate between top, middle and bottom.